The increased use of home electronics and entertainment systems has led to the situation that, not only are homeowners using extension leads for their TV area but also for many other areas in their homes. Homeowners and clients always prefer an increased number of socket outlets; surveys have shown that 50% of new homeowners require additional socket outlets within twelve months of purchase of a new dwelling. A Report of the Electrical Installation Industry Liaison Committee (EIILC), first published in 1977, made proposals for the minimum number of socket-outlets, which should be provided in homes. These proposals were made particularly on the grounds of safety – safety for the user, the installation itself, the home and of property – and for maintaining that level of safety during the life of the installation whilst allowing for the changing needs of the user. This EIILC report has been extended to also cover the minimum requirements for existing and foreseen standards of living and the use of electrical and electronic equipment in the average home. The use of such equipment in the home has increased dramatically as can be seen from the chart overleaf. The minimum requirements advocated in this Report are to be found in Table 1, which covers all types of dwelling e.g. public housing, affordable housing and private development. The chart, which follows, illustrates the significant increase in consumer equipment, which has driven the need for increased number of socket-outlets. Three or more television sets in one home are commonplace together with home entertainment systems, DVD/video recording equipment – which usually remains plugged in – and also the use of home computers and peripheral devices. In the last seven years the use of electrical equipment in dwellings has increased dramatically as shown. Some electric equipment, which was formerly battery operated is now available in a mains/battery form and this equipment often remains, connected to the mains via its charger. All of the above will create potential hazards, namely risk of electric shock or injury and damage to property through fire. “Reasonable provision shall be made in the design and installation of electrical installations in order to protect persons operating, maintaining or altering installations from fire or injury”. 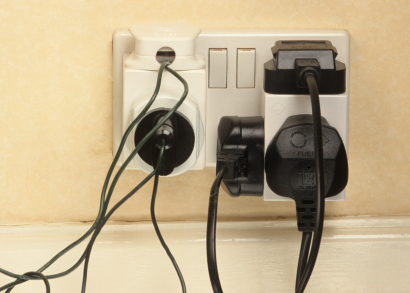 An inadequate number of socket-outlets will lead to an increased hazard due to the consumer being encouraged to cascade extension leads and / or stack adaptors. Use the building and its facilities. Clearly if socket-outlets are not conveniently located they will not be used. They need to be suitably distributed around the room, due account being taken of furniture, electrical equipment and future change of use.